Reut & Neil’s Miami Beach wedding reception at Emanuel Luxury Venue was romantic and beautiful. The couple posed for photos in Soundscape Park, across the street from the Miami venue, in the shade of the spectacular bougainvillea vines that climb the impressive pergolas lining the edges of the park. Later in the evening, photographer, Emily Harris, captured an iconic night time shot of the couple embracing on Washington Avenue, in front of ELV, with the neon signs of the area’s Art Deco hotels lighting up the background. Table centerpieces in the Grand Ballroom featured tight arrangements of white and blush roses amongst tall transparent candelabra which were placed on mirrored table runners. The glass candleholders, candelabra and mirrors reflected the shimmering lights, effectively augmenting the romantic theme. Alternating tables included tight arrangements of white, ivory and blush roses in tall glass vases. 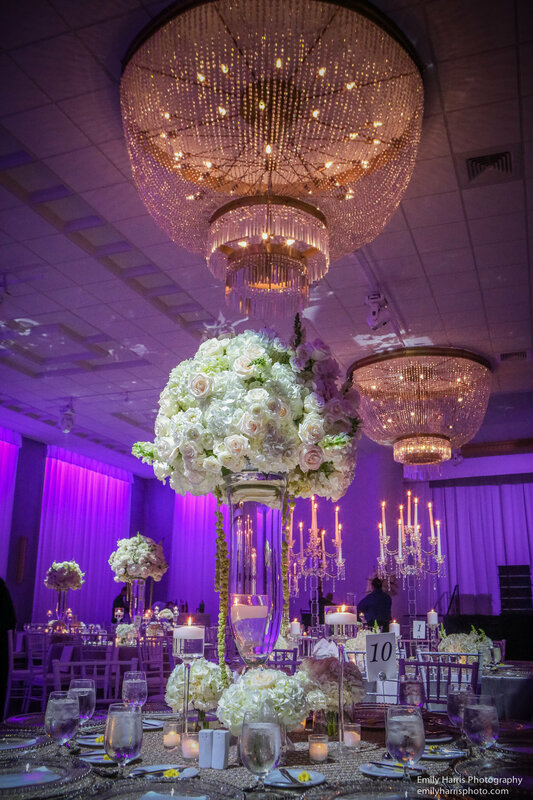 Emanuel Luxury Venue’s state of the art surround lighting set the tone with soft lavender hues, which sparkled in all the reflective surfaces that were part of the decor. Cocktail stations and a sumptuous three course, sit-down dinner, followed by an exquisite three-tiered wedding cake, were catered by ELV Culinary. Guests also enjoyed late night snacks as they celebrated late into the evening, with DJ provided by Samba Entertainment. A sit-down dinner catered by ELV Culinary was followed by a wedding cakes, also by ELV Culinary, and a lavish display of petit fours and late night treats. A DJ from Samba Entertainment kept the party dancing late into the evening. The bride was resplendent in a gown by Carolina Herrera.